Augmented reality could be the "next big thing" for Apple, according to the latest research from UBS analyst Steven Milunovich. Milunovich believes that Apple could equip the iPad and iPhone with AR-enabled hardware such as sensors, 3D cameras, and custom chipsets over the next two to three years. He speculates the iPhone 8, for example, could have "moderate 3D mapping using stereoscopic vision" based on a technology called Simultaneous Localization and Mapping. SLAM solves the chicken and egg problem of mapping a space without prior knowledge. The device starts from one angle and collects points of data. As the device moves, it observes how objects shift and begins to fuse data to create an environment. As the 3D map is forming, the device begins to understand its own positon in the context of the environment it is trying to map. SLAM underlies most of the advanced AR technologies available today and will likely be critical in the future. In 2015, Apple bought software company Metaio, which had one of the most advanced SLAM-based AR engines available at the time. The company has been silent since being acquired, but according to our industry checks it's likely the core team has remained and the IP could play a key role in Apple's strategy. Milunovich, citing "some industry sources," added "there may be over 1,000 engineers in Israel working on projects that could be related to AR," but he expects Apple to slowly roll out augmented reality features until the technology becomes more mainstream and "reaches a level of maturity suitable for Apple's brand." Perhaps related, iPhone 8 development is said to be ongoing at Apple's offices in Israel. Earlier this month, Apple acquired Israeli startup RealFace, a cybersecurity and machine learning firm specializing in facial recognition technology. And in November 2013, Apple acquired Israeli 3D sensor company PrimeSense. Milunovich said that because new technologies must fit within and grow the Apple ecosystem, the company will likely release an augmented reality SDK that is tightly integrated with iOS. Beyond the next two to three years, Milunovich thinks an additional AR-enabled hardware device is possible, citing tech evangelist Robert Scoble's belief that Apple will launch a pair of smart glasses in partnership with German optics company Carl Zeiss. The report said the glasses could launch as early as 2017. In November 2016, Bloomberg likewise reported about Apple working on a pair of smart glasses that would connect wirelessly to the iPhone and display "images and other information" to the wearer. Scoble recently told MacRumors that Apple is "readying a three-ounce pair of glasses that pair with the iPhone 8 for mixed reality." He insists that "mixed reality," which he refers to as "next-generation augmented reality," will be key to Apple's future products. Treat this info with a proverbial grain of salt for now. 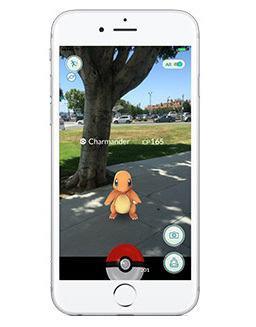 Apple CEO Tim Cook has repeatedly expressed his interest in augmented reality. He recently said AR is "a big idea like the smartphone," but noted "there are things to discover before that technology is good enough for the mainstream." In the past, he said AR is "profound" and should "amplify" human contact. Macs are not capable of developing for either VR or AR... their GPUs are far too poor. Another self-inflicted injury from Tim Cook. Then again, I don't know anyone that still plays Pokemon go at all..
A smartwatch I'd use, but smartglasses? Pass. AR glasses. Another iteration of something that is a solution in search of a consumer problem.